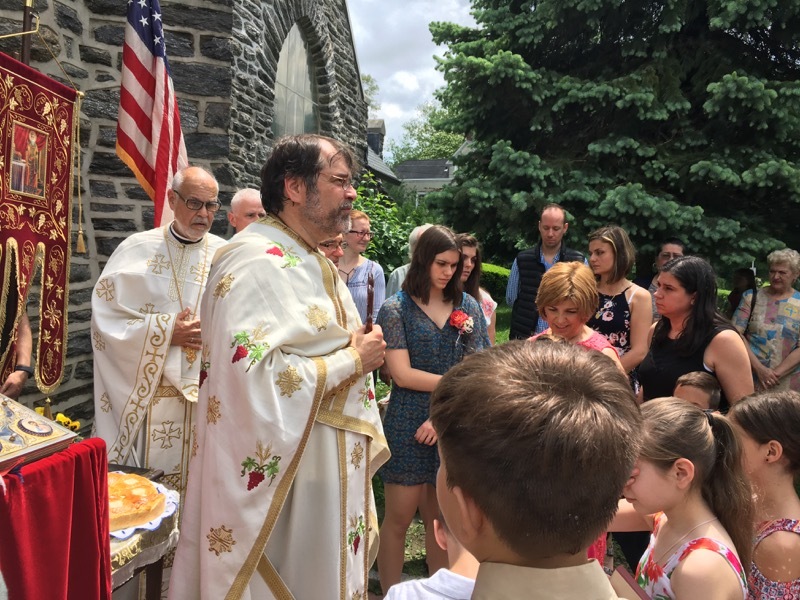 On Sunday May 20th, 2018, St. Nicholas Serbian Orthodox Church of Philadelphia celebrated its Patronal Feastday, the Translation of the Relics of St. Nicholas the Wonderworker. The celebration began with Divine Liturgy, which was led by Fr. Milorad Orlic and Fr. Emmanuel Pratsinakis, retired parish priest of St. Thomas Greek Orthodox Church in Cherry Hill, NJ. The celebration of the Divine Liturgy was magnified by the large number of faithful present, and the burgeoning children’s choir who sang “The Lord’s Prayer” and several hymns during Holy Communion. Following Divine Liturgy the faithful, led by the clergy, proceeded in festal procession around the church. 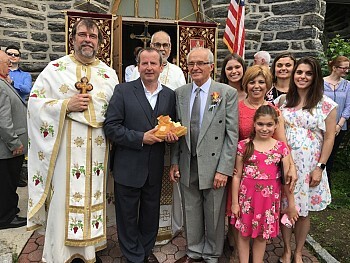 The procession was beautified by the new banners donated by the Randjelovic family, and which were carried for the first time in a procession by father, Sasa Randjelovic, and son, Dimitrije Randjelovic. Honored kumovi for the Patronal Feastday were Slodoban and Donna Janikic with daughter Jasna, as well as daughters Jessica Ivanovic and Jennifer Dileo with their families. Upon completion of the procession, the Slavski Kolac and Koljivo were blessed in front of the church, with the children energetically participating in the turning of the Kolac. Upon completion of the Blessing of the Slavski Kolac and Koljivo, Fr. Milorad inquired if there was anyone willing to assume the honor of kumstvo for the following year, to which Petko Alekisc responded that he and family would assume the honor. Upon distribution of anaphora, all proceeded to the church hall to enjoy a magnificient meal prepared by Kum Slobodan Janikic with Kolo President Snezana Baradakis and volunteers. The joyous fellowship continued until late in the afternoon.